Distilled: 6/27/1996, Bottled: 4/21/2016, Matured in a Hogshead, Cask No: 6406, 269 Bottles, Specially selected for The Bonding Dram, Single Malt Whisky Shop and Prima Vinum. 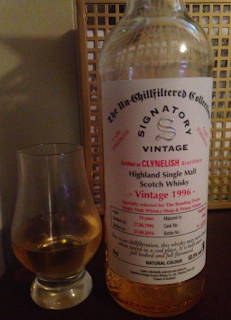 Everyone always calls Clynelish "waxy", as if that's a flavor. Are they prone to eating candles? Devouring beeswax? It's one of those ubiquitous tasting notes like "stewed plums" that's meaningless but fills space when writing a loquacious review. Well, enough of that nonsese. This bottle is everything that's great about the 1995/1996 series of Signatory Clynelish that have been hitting the market in the past year. A malty/cereal nose with some almonds. Palate is heavy bourbon/vanilla, and moves into spicy kick of cloves at the end that almost tastes like mild peating. Tastes like a first-fill bourbon, though the bottle doesn't list it as such. It's excellent at cask strength. There are some blogs where the reviewers will say: "Here's my score at cask strength. Now at 50% ABV. Now at 40%. And now here's my score of a full glass of tap water with a drop of this whisky..." and so on. What's the point of all that? We don't have the time, mate, and most of us buy cask strength to drink it as such. That said, with a drop of filtered water (reverse osmosis, always! ), some bitter/Campari notes come out a bit, in a good way. I prefer it without, but both version are good. Great malts swim well and this is no different. Score: 88 pts/B+. Priced at 75 Euros, it's worth buying and a bargain. 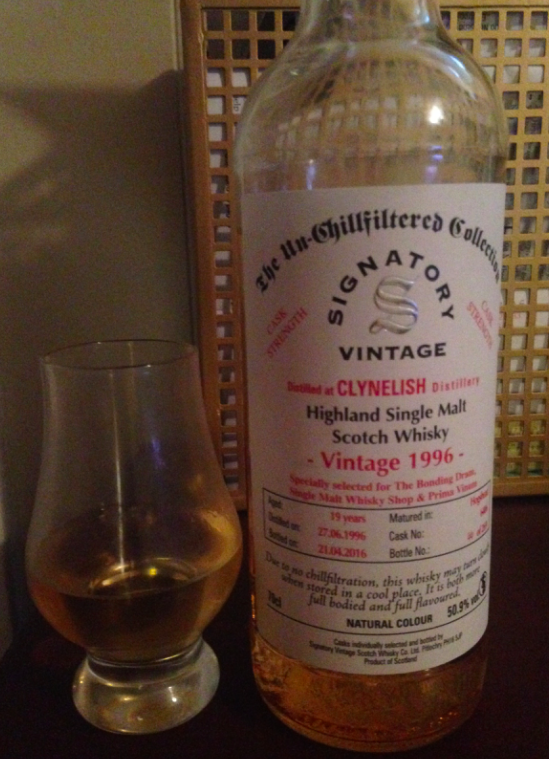 Do you like vanilla/bourbon cask Clynelish? This is one of the better ones, and I've tasted a bunch of the sister casks, both bourbon and sherried. Kudos on the great pick. tl;dr review: Buy the bottle already, it's dope, son.